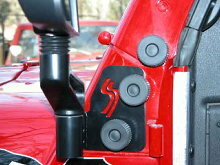 These mirror relocation brackets are designed for the mirrors that came on1990-1995 Jeep YJ's. They come with all the mounting hardware including hand knobs to make removing them a snap. The other nice thing about them is that they attach to the sides of the upper part of the windshield hinge instead of to the lower part. This makes installation MUCH simpler since the nuts are actually retained within the windshield frame, unlike the nuts on the cowl which typically spin if you try to remove the bolts. The picture shows the TJ models as we don't have any photos of the YJ brackets yet. They are similar, but don't have our logo cut into them since there just wasn't room. Sold in pairs to relocate both driver and passenger-side mirrors. Individual relocation brackets are available as well, contact us for ordering details.